Airship's ready-to-use 1st Flight app lets you kick the tires (and honk the horn and try the turn signals) immediately. Install the app and send yourself some notifications. Create an account on go.urbanairship.com. Install the 1st Flight app on your iOS or Android mobile device. 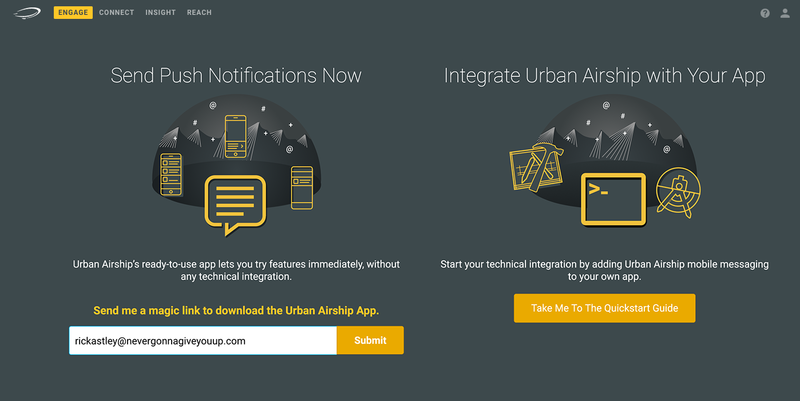 Compose push notifications from go.urbanairship.com, and see them on your mobile device. Bonus step: Download our Postman Collection and experiment with our API. Sounds good? Let's get you set up. Enter your email address and hit the Send button and we'll send you a magic link you can use to download the app. From your mobile device, check your email for our message and click the message's magic link. Your device's app store will open to the Airship app. 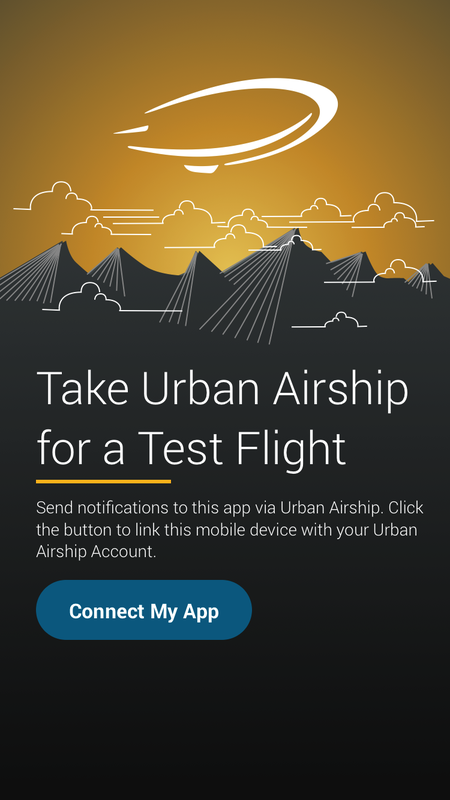 Following a magic link syncs your go.urbanairship.com account with the 1st Flight App on your device. If you downloaded the app from the app store without using a magic link, the first time you open the app you will need to enter your go.urbanairship.com username and password. Automatically fill in the fields by requesting and following a magic link now. 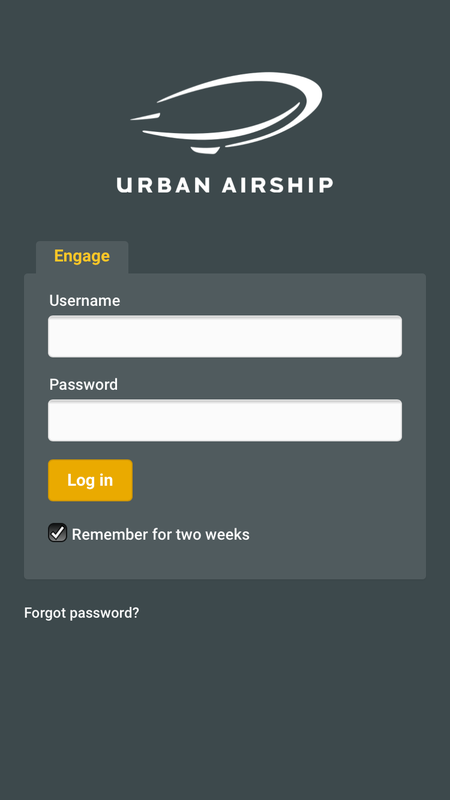 Log in to go.urbanairship.com and choose the 1st Flight app, then you’ll have the option to send yourself a magic link. If you don’t have a go.urbanairship.com account, create one now. After following the magic link you will return to the same screen but the fields will be populated. Just click the Log in button and you'll be ready for the next step. If you're using an iOS mobile device, click the Allow button, which allows the device to receive push notifications. Push is automatically enabled for Android, so this screen will not appear for Android mobile devices. You're all set. Let's send a push notification to your mobile device. Compose and send a push notification, and receive it on your mobile device. We'll try out a few features along the way, too. Open the 1st Flight project from the dashboard, then click the Create button, and select the Message workflow. Select the radio button for All Users, then click Content in the progress header. Click the pane for Push Notification, then click the Continue button that appears. Enter your message in the text field and you will see it in the device preview. Select Web Page from the Message Action dropdown menu, then enter a URL. We recommend http://bit.ly/IqT6zt. When your device receives the message and you tap the notification, its web browser will open the URL entered here. Toggle to enable the Title option. Enter a title in the text field and notice its position in the preview. Click Delivery in the progress header to move on. Select the option for Send Now, then click Review & Send in the progress header. Review the information on the left side of the screen, click through the images in the preview, then click the Send Message button at the bottom of the window. Take a look at the message as received on your mobile device. Tap the message, and the device's browser should open the web page defined above. Now that you have installed the 1st Flight App and successfully sent yourself a notification, you might want to try using Automation and In-App Automation to automatically issue relevant notifications to your test users. Use the Automation Workflow to automatically issue notifications relevant to your users based on their recent behavior, e.g. entering a particular area, viewing a screen/page multiple times, etc. Try using the In-App Automation Workflow to pre-cache and display highly contextual messages in response to user behaviors within your app. Using In-App Automation, you can even reach users who may have opted out of traditional push notifications. Now that you have the 1st Flight App installed and you have successfully sent yourself a notification through the Airship dashboard, you might want to familiarize yourself with our powerful Airship API. You can use Postman to try a variety of push notifications using the Airship 1st Flight Postman Collection. After you install Postman, click the Run in Postman link below to automatically import our collection into your Postman account. Send more notifications! Our Message workflow tutorial walks you through all the features and options. Integrate Airship with your own app. See: Create a New Messaging Project. What can I use the 1st Flight app for? 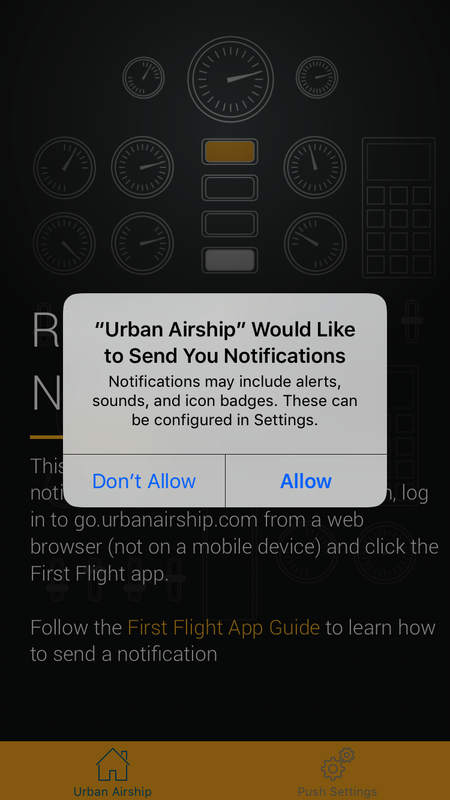 The 1st Flight app is designed to let you start sending notifications to yourself with a minimum of fuss. Building a sample app or integrating a new SDK into your existing app can take time and involve technical folk who might not be available. We want to make it as easy as possible for you to see the world-leading engagement suite Airship provides. I'm currently on a free plan can I use the 1st Flight app? Of course! All customers have access to the 1st Flight app. Use any features in the Message workflow and API that are available in your plan other than Message Center and Location History. Are all message features available in the 1st Flight app? Unfortunately we don't currently support Message Center or Location History. All the other notification features included to your plan are available through both the Message workflow and API. Can anybody else send messages to my installation of the 1st Flight app? No. The magic link you used to connect your app and Airship account use a unique app key. While other people have their own apps, they will never be able to see or message your device or vice versa. Will reporting work for notifications I send to the 1st Flight app? Yes, our push reporting does work for the 1st Flight app. Does the 1st Flight app only work on phones? No, the 1st Flight app works with tablets too.